So a big Kickstarter project, $70k plus whatever he got afterwards, and the guy doesn't even invest a few hundred into simple backup? That was one of the problems in my thinking. All this time I automatically assumed that Whitman would not be so incompetent as to NOT have a second backup of all the files at all times. Now we find out the truth is that Whitman so mishandled the safeguarding of that device that no can even be sure when the last drive was lost, sold, or gone. Plus it looks like Whitman's friend or 'his friend' that lost or sold the drive is Ed Kramer. Wait.... Does he still HAVE the original 4TB hard drive, which locked up? What's the going rate for professional drive recovery services? I don't have a position on whether or not anyone should seriously consider that option, I'm just curious as to whether or not it IS an option. No, Whitman lost both 4TB drives prior to Gencon 2015. I posted a message and a document with the court over the weekend, but on Saturday I found out that any device that might have had footage was left with a friend of his over three years ago. One of the devices was the dead 4TB and the other was, at the time, a still working 4TB drive. Whitman then went off for some months. While the devices were with the friend, the friend got evicted from his apartment. Whitman contacted the guy later and the guy said he didn't remember seeing anything when he moved out. I talked with a person on Saturday that had first hand knowledge of the stuff. Apparently, up to a year ago, it was all stored in a barn, along with some film/movie making props. About a year ago the barn burned down and everything was completely destroyed. So, if Whitman had said something as little as a year ago, the devices could have been tracked down and maybe ok, but after the fire everything was destroyed and they are gone. Incompetence at its worst. What a complete moron. I'm not clear Louis. If you don't mind my asking, what exactly happened today? Did Ken actually come clean to you or was this all just your supposition? I ask because the Ken Whitman we all know is most likely simply going to claim that you withdrew the suit because you had nothing, and/or because Kickstarter and he got it dismissed (like his earlier boast yesterday). Did he communicate to you that he lost the files by phone or email? And then you withdrew? I'm asking because I didn't see anywhere in the papers where it states that he actually told you himself that he lost them. Section 1 comes close but doesn't explicitly state that. I get it if you make that guess. It makes sense. But Ken's a pathological spinmeister and we all know how he's going to spin this. One of the exhibits added today is an email chain between Louis and Ken. In it, Ken says that one 4TB drive “locked up” and he left the backup 4TB drive with a friend. Ken’s friend was evicted, and after moving, the backup drive was nowhere to be found. Emmett, Kenny's admission is in Exhibit AB, which is emails from Kenny to Louis dated July 30, 2018, where Kenny explains what happened to the drives and the files. Then Louis' following Memorandum summarizes what Louis has determined from all of the preceding evidence and Kenny's admission. Thanks guys! I must not have seen AB. Whitman has confessed and was obvious once I had the admission from Whitman about the devices. It was partly because of the upcoming court dates and partly because once I realized the truth and reported it, Whitman is in very big trouble with the people around him that have been helping him with everything he put all of them through because of his lies all these years. This can't be the end. There's no way he's going to be able to get away with it again. $200k gone and Whitless escapes scott free. "Working for life..." doing what, exactly? Who in their right mind would pay this man even to move rocks from one place to another? Well, we know what happened to the footage, and now I am seeing if I can find that, so it is not over yet. After that, well . . . lets see what else happens first. Remember, everything I did so far was only civil. "doing what, exactly? Who in their right mind would pay this man even to move rocks from one place to another?" Court-enforced restitution is a thing. Someone is required to have a job (or go to jail), keep the job (or again, go to jail), and then provide some reasonable percentage of his earnings to those he's damaged (or again again, go to jail). I know this wasn't a criminal suit, but this would be the only reasonable endgame at this point to actually feel like something good happened - Ken has to work for the rest of his life (or however long it takes) to give every non-essential penny he makes back to those he's caused damage to, or he goes to jail. People have embezzled a lot less than Kenny in their life and had to either do this or face jailtime, there's no reason we should spare one of the lowest forms of life on earth the same choices. I do not think this situation is 'all over' by any shot. While people had already noticed what was going on here since Whitman stole from over 2,000 people plus multiple reports to various state and federal agencies, it looks like 'the system' is starting to take notice. Whitman mentioned to me that when he was trying to get approval for the phone conference that one of the people he talked to at the courthouse made the remark 'oh yea, the Kickstarter case'. That is somewhat of a surprise that the case was gaining notoriety plus the documents are on the docket forever for anyone in the world to look at and see what an outrage it is. 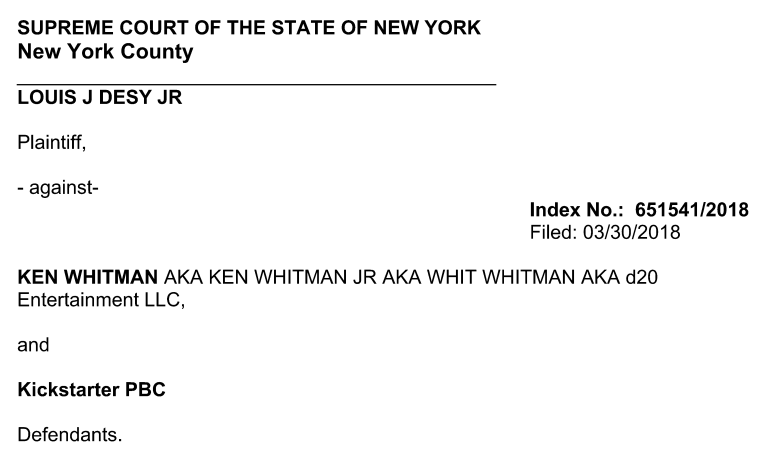 I think people within the system are going to start taking a look at it, especially start to ask, "How did Whitman pay takes on a company that did not exist?" Therein lies the rub - Kickstarter does not withhold taxes when it pays out. Does ANYONE think Ken paid taxes on ANY of his Kickstarter projects? wanted to add one thing after talking to my wife about this. All of Ken's comments about how we all were ruining his life by hounding him for the KickStarter rewards for KODT: LAS. That is all now entirely on him ... not any of us. A single moment of honesty in that meeting with Kenzer at Gen Con 3 years ago that he skipped out on would have meant a firestorm ... but one that would have died out. Stuff happens to KS projects ... people lose their money ... turn the page. He knew at Gen Con 3 years ago that he could never deliver this project and instead decided to go on a rampage of personal attacks against multiple people for years rather than tell anyone a single moment of truth. It also means he really did pocket almost all that money from all the KS projects. No idea what he did with that much cash ... but I'm guessing less than half of it actually went to any of the 6 projects. Guy has played the victim card so much ... but yeah ... today ... I realized more than ever .... its a bed he totally made for himself and kept remaking every day for the last 3 years. That is the big problem. If Whitman had confessed as to what was going on as soon as he knew, people could have at least tried to do something and had a chance to save everything. 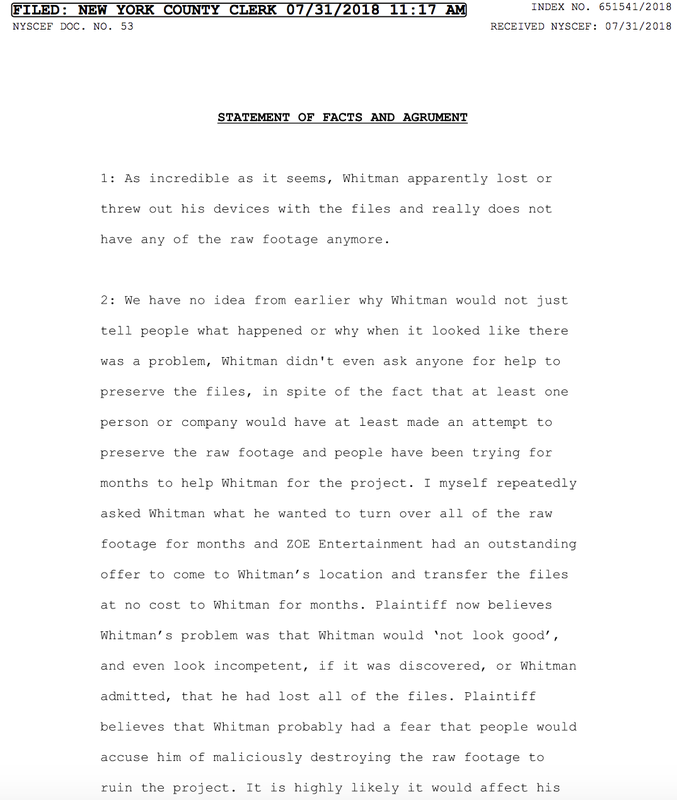 Instead Whitman ran around yelling at everyone and caused all kinds of chaos when the truth is that the footage was all gone, which would have NEVER happened if he had made a proper backup. If Whitman couldn't afford to do that, someone, I am sure, would have done something to help and safeguard the raw footage. Instead Whitman runs around yelling at everyone when they ask, "What is going on" or threatens them for talking about it online? I am only able to find out once I go through the whole process of a court case and it starts to get near to the dates for court dates and even that was a near thing. If the lawyer for Kickstarter PBC did not wait until the last possible day to file their answer, and didn't do it a few hours before the day running out at 9pm, Whitman would have never fessed up to anything and would still would be evasive about whether or not the footage even existed. Well, I got a message to Ed Kramer so lets see what I get back. Maybe on top of finally finding out what happened to the raw footage I will be able to perform 'one last miracle' in 'The Case of The Lost Footage' of finding any of the devices and retrieving the lost footage! The 'friend' that had the hard drive and was lost in an eviction from an apartment, I think 'the friend' is Ed Kramer! 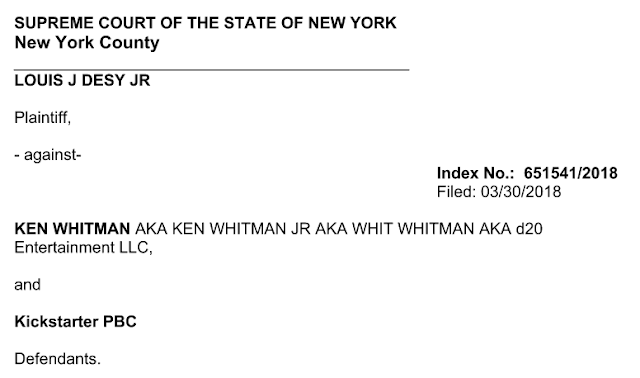 Whitman think that 'his friend' may have lied and sold all of Whitman's hardware for cash. If it is Ed Kramer, Kramer got kicked out of Dragon Con July 2013 and probably was running out of cash a while later, so the timeline fits. Whitman comes and stayed for a while when he ran from Kentucky to Atlanta with Ed Kramer; and Kramer is probably 'the friend' Whitman left his stuff with. I made an inquiry this morning with Ed Kramer to ask if he has any information on the devices and the raw footage. The reason Whitman is providing information, even without the case, is because I suspect the people around him, even supporters, are all in shock as to what everyone went through because of his lies going back years and he is in BIG trouble with all of them. Normally, with the win in court, Whitman would be running around and boasting about how smart he was and did nothing wrong. But, as you see, Whitman does NOT dare do that since the people that supported and helped him are all probably very upset with his lies for all these years. Plus the incompetence in not backing up the footage and losing everything for ALL of the Kickstarter projects is truly what has done it for a lot of people. As an update, I am GLAD to report, the 'friend' is NOT Ed Kramer. I thank you Louis for pursuing this, because it's cases like this that help the entire crowdfunding sector be legit (mostly) knowing that, when push comes to shove, there's gonna be people like you who will stick up for backers. We all know (or should know) going into a KS that you may not get anything. It's not a store. However, we DO expect due diligence from the creators to at least not be morons with our money, and to be honest. One more point in all of this, that may not be entirely clear, the devices contained all of the files for all of the projects, so Whitman lost the Traveller footage also on the devices when they went bad/missing/lost/sold. I reached out to Ken with an offer to get the deck dice KS fulfilled for him. Waiting for a reply now. I thought Deck Dice was "fulfilled," and that it was the pencil dice project(s) that were crapped upon. He has not fulfilled a single kickstarter he has run. Yep, I see that now. I don't get it, is they guy a narcissist, what's the advantage, or benefit in not admitting the truth? The whole thing, just seems really bizarre. I think the problem is that Whitman was still trying to get film/movie work back around the time of Gencon 2015. After Whitman fled Kentucky for Atlanta it looks like he was working with some actors group there. 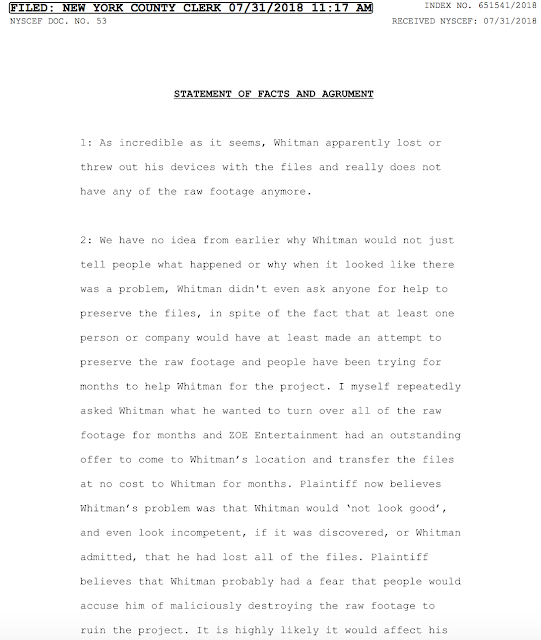 It would have hurt his ability to get work if it came out that he lost all of the footage on multiple projects, so Whitman hid that from everyone and hoped that no one would ever figure it out, and it almost worked. "it almost worked"... It did work unless he has to pay something back to someone. This is just the end of the cycle and he'll come up with something else within a year or 2. Which is why we need to see what the next step is the legal system. "Movie making is a crazy business, with a lot of unknown factors. We start with a script, assemble the best team possible, get insurance, get everything approved by Far Future, and make contingency plans. It's impossible to guarantee everything will come together exactly as planned, but in the end, we will have created a movie that hopefully all of us can be proud of." Film Production and Completion Insurance covers loss of media. Did Ken actually have Completion Insurance? Did he get a payout for the loss of files?